A visitor lands on your website and then immediately clicks the exit button — Oh no! It’s the dreaded bounce. It only takes about 0.05 seconds for visitors to decide whether they like your eCommerce site enough to stay or bounce away. Given that bounce rate is a common phenomenon, eCommerce stores have leveled up on their engagement by grabbing their visitors’ attention from the moment they enter their site. This effort to enhance customer experience has led to a marketing discipline which helps to reduce bounce rates — eCommerce personalization. Today, we will tackle how the apprehended high bounce rates can be solved using eCommerce personalization. If you think that your bounce rate is rising, we will help you re-evaluate your website and equip you with the best personalization techniques to display tailored fit messages and provide individualized experience to your visitors. Before we proceed to personalize your site, let’s understand first about bounce rate, why you need to pay attention to it, and what causes it anyway. 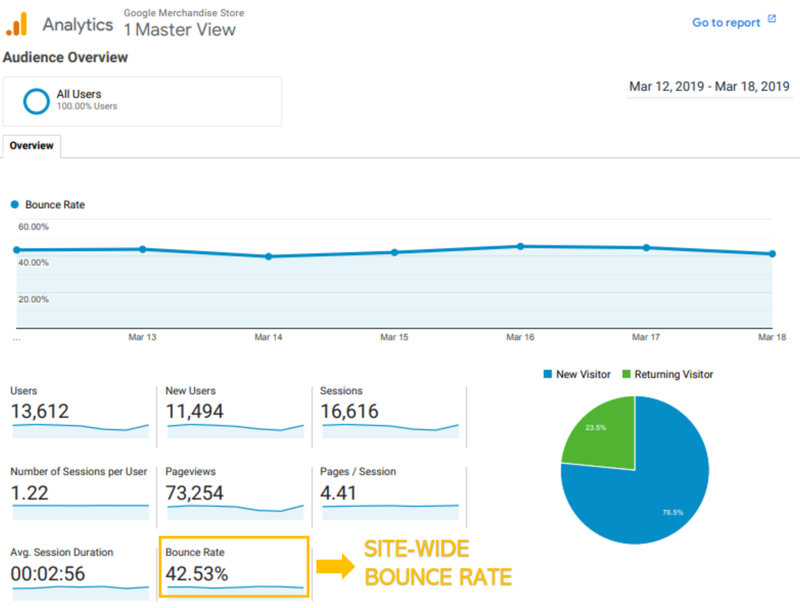 What is a bounce rate? Why does it matter? A bounce happens when a visitor lands on a website and then slips away without interacting further with it. Your bounce rate measures the percentage of visitors who navigate away from your website after viewing only one page. A high bounce rate signals that there’s something off-putting on your site. It could also tell you that you might be attracting the wrong audience to your site. If you have a high number of bounces, this directly impacts your conversion rate. The more people leaving your site, the fewer people you have left to convert. This means less revenue for you. What bounce rate is acceptable? The truth about an “acceptable” bounce rate is it’s always contextual and subjective. There are many areas to factor in, such as industry, products, competition, etc. Each eCommerce website has different objectives and goals, so what may be acceptable to one site may not apply to another. But, in reality, a good benchmark to an acceptable bounce rate is always lower than what you had before. What’s alarming is when you see a rising number of bounce sessions. This needs to be understood and addressed as soon as possible. The quality of the website: If your site is unpleasant, uninviting, and technically flawed, it drives visitors to leave. These include slow loading page, broken links, poor design, poor navigation, low-quality contents, etc. The intent of the visitor: If the site’s purpose and what the visitors are searching for do not match, they are driven away to seek other contents. This also reveals hidden problems like possible bad backlinks from referral sites and misleading headlines. The completion of a goal: If visitors have already obtained the information they need from other sites. The term eCommerce Personalization refers to the process of dynamically displaying tailored fit messages and customized experiences to an individual. This process is done by using and analyzing personal data like demographics, buying behavior, and browsing history to uncover patterns relevant to visitors. This makes eCommerce personalization a sound business choice because it helps online stores to anticipate and address customer expectations. In fact, 33% of customers have stopped their relationship with a company with insufficient personalization. Better conversion – 86% of customers say personalization is critical in their purchase decisions. Increased sales – 40% of shoppers are more likely to increase their purchases from a website with personalization. Improved loyalty – 56% of online shoppers are more inclined to return to a website offering personalization. 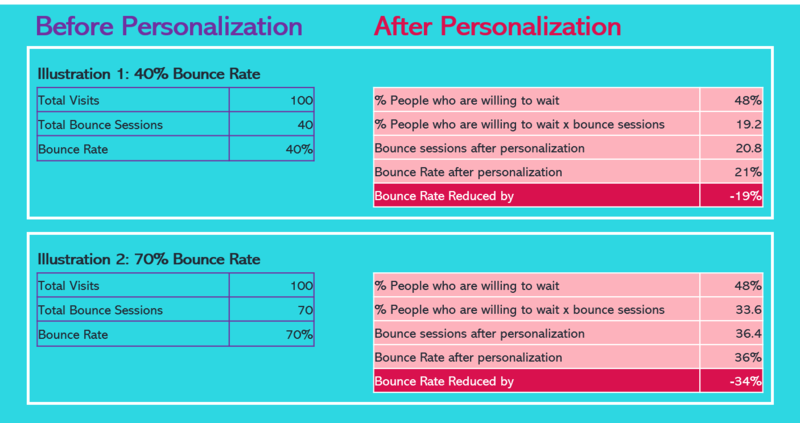 How can eCommerce personalization reduce bounce rates? So, how can it help in preventing visitors from bouncing away? In a study by Deloitte, 48% of customers reported that they would be willing to wait longer in order to receive personalization such as personalized product or service. Using the principle above, websites experiencing high bounce rates between 40% to 70% can reduce bounce rates by more or less 20% to 30%. If 48% of your 40-70% leaving customers are willing to wait if personalized experience is offered, you can significantly reduce your bounce rates by roughly 20-30%. Personalization should start at your homepage. When visitors land on your website, you should already be able to grab their attention with relevant messages and direct them to the products that might stir their interests. Personalizing your homepage can help you uplift sales by 7%. You can have a personalized homepage by dynamically changing its contents and appearance to match the type of visitor: returning or new. Remember, your new visitors are not familiar with navigating your site. Complex and confusing navigation could potentially drive them away. Make sure that your visitors know where to go next. You also need to make new visitors feel welcome and get them acquainted with your site as quickly and easily as possible. For example, Uniqlo has a welcome popup message to make their new visitors feel at home. It also includes a sweet discount to catch its visitors’ attention. You can steal this welcome popup using the Better Coupon Box tool from Beeketing. Since new visitors are not familiar with your products, you can also show your popular items or trending products at the homepage to get them acquainted with what you have to offer just like what Adidas did with its homepage below. Your returning customers will be also delighted if you recognize them when they get back to your site. Thank them for visiting you again. Tell them you’re thrilled and maybe delight them with a reward as a token of appreciation. For example, Zalora offers a site-wide discount to its returning customers. A user’s browsing history is an essential eCommerce personalization technique that you can offer to your visitors. Amazon, the eCommerce giant, is famous for employing this strategy. What’s interesting is when your return and log back into its site, a ‘Browsing History’ link is in its navigation menu. Offering your customers’ browsing history makes their online shopping more convenient than ever because they already have access to the products they are most likely to browse again. This cuts the time of browsing for different links. Thus, speeding up their path to conversion and can help you lift sales by up to 10%. 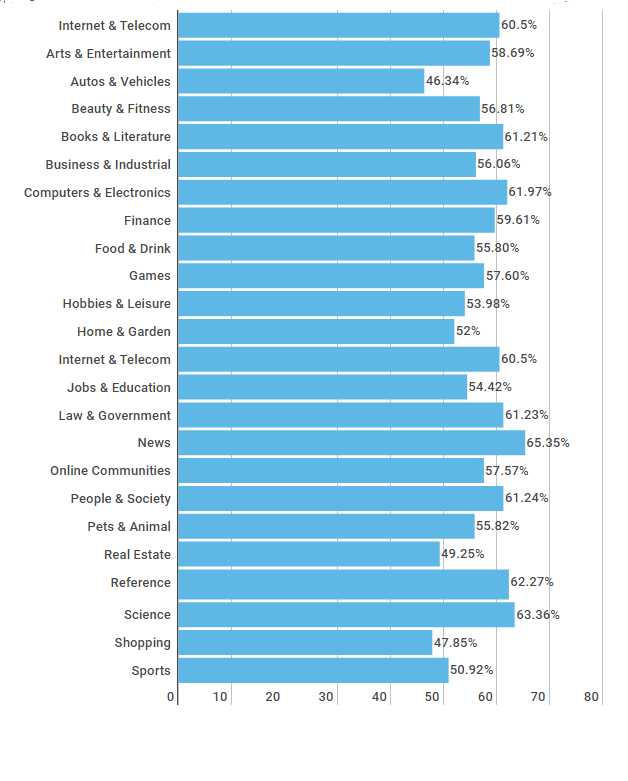 Every traffic coming into your site has different motivations and goals for visiting. It’s a big no-no to display the same type of content to different types of traffic. If you do this, you are not stirring your visitors’ interest because they cannot relate to your contents. A successful eCommerce personalization starts with a great understanding of your visitors. Your contents and messaging must adapt your visitors’ persona, intentions, interests, and likings. 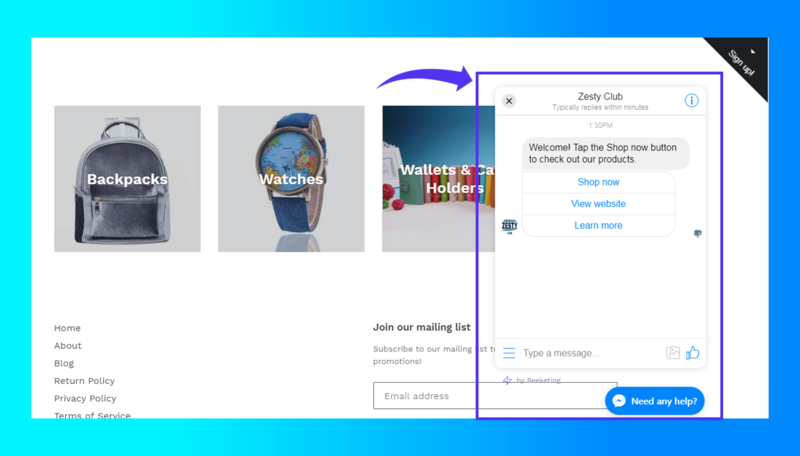 For instance, if you want to offer a coupon code to a visitor, you can personalize the copy or call-to-action of your popup coupon based on what the visitor is currently browsing. 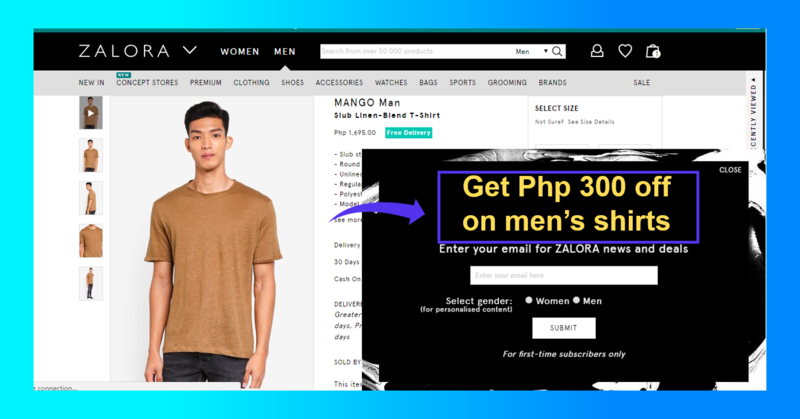 A great example is how Zalora dynamically changed the call-to-action of its discount offer. A visitor browsing men’s t-shirt is displayed with a 300-off on men’s shirts too. Your product pages are designed as a sales pitch model to tell your visitors more about your products, their benefits and features, and why they’re worth it to buy. Thus, personalizing your product pages is an essential part of eCommerce personalization. 27% of customers said that they want to get personalized product recommendations so it’s important that you showcase supplementary items that your shoppers might be interested in. For example, Overstock has a “Coordinating Items” section at the bottom part of its product page so whenever a shopper browses a bed, complementary items like bed sheets and pillows are displayed. Showing what other people bought alongside the product they’re currently viewing can also help you optimize your product page. For instance, Radiant Life has “People who purchased this product also purchased” section at the bottom of a product page to recommend more items. Aside from the product page, also a great area to offer personalized recommendations is at the cart page. In fact, 92% of customers want to be recommended with products when they are viewing the cart page. Suggesting relevant items at the cart page can help you increase your average order value. You can do this by applying upselling and cross-selling strategies. The shopping cart is a good touchpoint to upsell and cross-sell more products by using the visitor’s browsing activity and cart items. An exit-intent offer can be displayed when a visitor is about to click the exit button. This can help you grab your visitor’s attention and momentarily stop them from bouncing away. Timing when and what offers would be displayed is a good customer experience booster because it’s real-time and personalized. The exit-intent technology from Checkout Boost can help you automatically trigger an exit-intent offer that will pop up right before a customer is about to leave your eCommerce store. You can also use exit-intent technology to capture email addresses. For example, Brooks Brothers display an exit-intent message to drive visitors to sign up. In eCommerce Personalization, real-time customer interaction and customer service like live chat are also vital. The main purpose of a live chat is to help visitors with their questions in real-time without having to email or call. You can offer a live chat on your site by using Facebook Chat by Beeketing. This type of live chat is much more personal because your visitors can use their Facebook Messenger accounts to instantly start an interaction with you. A rising bounce rate is one of the many predicaments shared by many eCommerce website owners. It’s a bit of a headache to see visitors coming into your site but then quickly fly away without a trace. While there are various reasons why visitors bounce, the key to reducing eCommerce bounce rates is to understand your people’s intentions of visiting and to check the quality of your site. That’s only when you can create a more meaningful and engaging customer experience through eCommerce personalization. An effective eCommerce personalization should put the person at its core. Ecommerce stores must primarily cater to the customer first before focusing on making a sale. By making the customer at the center, you are making it easier for them to look and purchase the products they want in their own pace and timing. In turn, this helps you drive them to conversion quickly and boost your sales further.